Well, who knew? You actually can teach an age-defying , serial entertaining , dog -lover some new tricks. 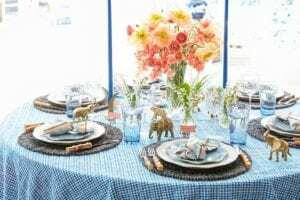 In this case, I am the age -defyer and last week while hosting an event with my friends at the new One Kings Lane Soho store, I learned a lot of new tricks for setting the party mood and the party table. 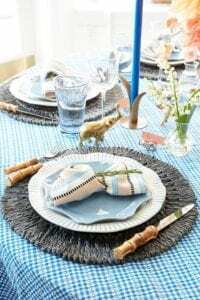 I sat down with three expert entertainers to chat dinner-party hosting and was inspired by their tips—and by a tablescape set around their favorite ideas. When it comes to entertaining, some serial hosts just can’t get enough. “It becomes infectious,” says Jane Larkworthy, editor at large at The Cut, who loves having friends over for casual dinners in her Berkshires home. “It’s a great way to bring people together who don’t know each other. And that can’t help but warm your heart,” says Jane. 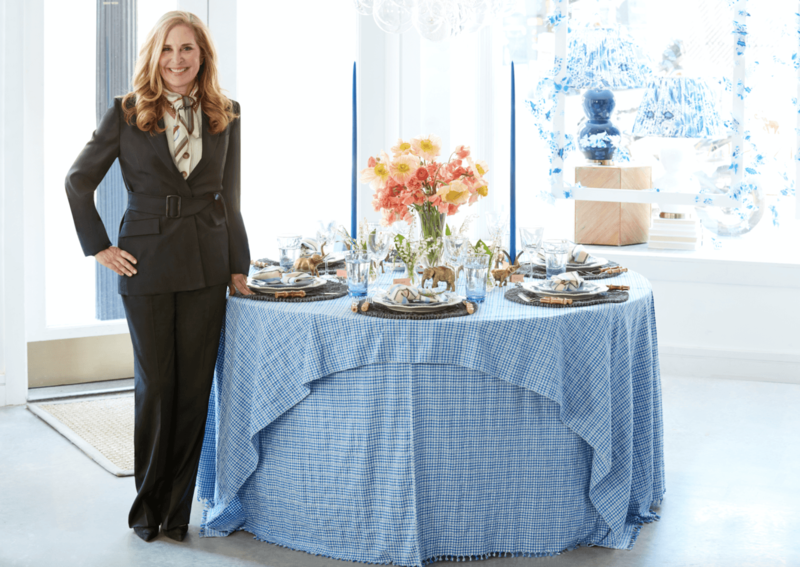 For Heather Taylor, founder of textiles line Heather Taylor Home, entertaining is when she’s happiest: “It’s such a precious moment, sitting around the table in a beautiful setting and eating delicious food. It’s my dream.” Eddie Ross, an author and stylist who runs a creative studio, turns to entertaining not only to bring people together but also to set a fabulous scene. “I think a table really tells a story of who the person is,” he says. Aging codes of etiquette still have a tight hold on entertaining ,and I have to admit, I still cling to a bunch of them but our experts recommend throwing those out if they’re not in line with how you host. “A lot of my customers are intimidated by the entertaining process,” Heather says. “But you can do whatever you want. Just buy something you love, build a collection over many years, and pull it all together in a way that makes you feel happy.” From the table to the drinks to the food, here are a few (completely optional!) guidelines these entertainers turn to for their own parties. Consider place cards. For larger events (those with more than eight guests), Eddie recommend creating a seating chart with place cards and I quite agree. In my view, when you have a lot of people, it’s total havoc if you don’t put them in a place. To mix it up, I like to have guests change seats after dinner for dessert. It’s a great way to allow people who haven’t met to mingle. “Or with family, you can keep certain people apart,” Eddie adds. Shop your home. One of Heather’s top tips is pulling together things from around the house to fill out the table—or “foraging,” as Heather calls it. If she doesn’t have time for a floral centerpiece, she’ll use a bowl of oranges or cut branches from her yard instead. I have been collecting elephants—the mascot of One Kings Lane—ever since I started the company, so I’ve got plenty of tabletop fodder all around my house. Prep beforehand. If you’re not a good multitasker or want to spend more time actually talking to your guests, consider a make-ahead menu. I’m a huge Ina Garten fan because she stresses preparing everything ahead of time. Maybe at the most, you just pop something into the oven to heat it up. Don’t test out a new recipe. You absolutely do NOT want to be doing something for the first time. If you want to try out a new dish, give it a practice run a few days beforehand to make sure you get it right for your guests. Guest books are commonly used for weddings and showers, but one can be a thoughtful (and useful!) tool for dinner parties too. Heather uses hers to document her soirees by writing down the guests who attended, the menu, and what the table looked like. It’s a helpful way to remember what you served to whom and which guests attended—not to mention a great way to reflect back on the happy memories. Heather Taylor Home’s linens add just the right amount of personality and color. Try knotting the napkin and tucking in a sprig of rosemary for an easy, elevating accent. 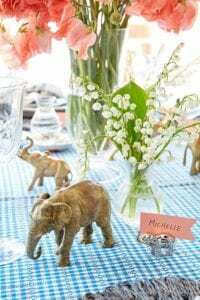 I cant imagine a table without an elephant or three and Juliska’s mini vases and Acanthus vase are in my all-time favorite and easy line-up, especially on long narrow tables where people need to see one another to talk and enjoy. I’m going to take most of these fantastic suggestions to heart. In fact, I just unpacked some old china of my grandmothers, to employ the saucers as salt sellers hack. Thank you, Eddie and Heather and Jane—you just bettered my tabletop world .